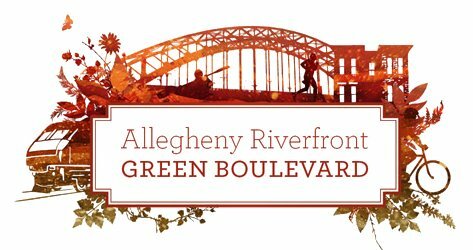 First public meeting for the Allegheny Riverfront Green Boulevard, November 17, 6-8 p.m. The Allegheny Riverfront Green Boulevard is a planning effort to transform a six mile stretch of the industrial rail line just northeast of downtown Pittsburgh into a multi-use rail corridor creating local links between homes, work, and recreation. The plan envisions special, urban districts where mixed use housing and work space form new types of communities. The first public meeting will launch the Green Boulevard study to the public on November 17, 2011 from 6:00 pm–8:00 pm. At this meeting, presenters will review updates on the outcomes of the vision plan and introduce new ideas for each of the major study areas of the Green Boulevard plan: open space, land use/housing, and transportation. Mariia Zimmerman, Deputy Director for the Department of Housing and Urban Development’s Office of Sustainable Housing and Communities, will help launch this effort and welcome citizens to the process. The meeting will be held at the Society for Contemporary Craft, 2100 Smallman Street, in the Strip District. For more information, connect at the project’s Facebook page or contact Lena Andrews at the Urban Redevelopment Authority of Pittsburgh, 412.255.6439, or email landrews@ura.org. You may have heard of the Urban Redevelopment Authority, or seen their signs around Pittsburgh. Or you might be aware of some of their past projects in Polish Hill, including the group of blue houses along Herron Avenue (at Dobson street, and up), the rehabs along Herron at Harding, or the homes at the end of Wiggins street. Sharon Wesolowski lives in the original home where she grew up in the Polish Hill neighborhood of the City of Pittsburgh. When it came time to address some desired renovations, she sought out a loan program that helps City of Pittsburgh residents, eventually landing her at the URA’s doorstep. “Three years ago, I applied for the Pittsburgh Home Rehabilitation Program (PHRP) – a $25,000 loan with 0% percent interest to renovate my kitchen and bathroom. Dave Martincic (URA construction advisor) worked with me to find a contractor I felt comfortable with. He provided me with a list and I chose three contractors to compare pricing. As a result, I ended up with a beautiful new kitchen and bath that has greatly increased the value of my home,” said Wesolowski. Sharon was so impressed with the URA program that this past year she participated in the URA’s Home Improvement Loan Program (HILP) – a $15,000 loan with 5.99% interest by applying for two more additional loans to cover a basement waterproofing project and installation of a new roof. Check here for more information about URA home improvement loans. Sharon in her newly remodeled space. The URA Board today announced that the Pittsburgh Home Rehabilitation Program has been enhanced to promote energy efficient improvements to owner occupied homes in the City of Pittsburgh. PHRP Plus features a $2,500 grant to be used to pay for an energy audit (required) and insulation, air sealing and duct sealing. Participants in this program are eligible to receive $10,000 above the $25,000 limit for the standard PHRP loan. The additional borrowing limit can be used for qualifying energy efficient improvements, including insulation, air and duct sealing, efficient heating and cooling, lighting, water heating equipment, and efficient windows and doors. West Penn Energy Solutions will provide energy auditing services which include diagnostic testing as well as combustion safety testing. A report will be generated that will provide recommendations for energy efficient improvements, along with the approximate cost and savings associated with these improvements. The URA will provide a Construction Advisor for each homeowner and along with the Auditor will meet with the homeowner to select improvements and finalize a work write-up. The URA can also assist the homeowner in having contractors competitively bid on their job. A URA approved licensed contractor is required for participation in the program. Interested applicants for the PHRP and PHRP Plus programs should contact Jenny Kohnfelder at 412.255.6639 or visit www.ura.org. The Pittsburgh Entrepreneur Fund is a revolving loan fund for start up and growing businesses including emerging technology based firms, such as Information Technology, Life Sciences and Green / Energy and other start up enterprises. The fund provides low interest loans for working capital and related start up costs, as well as puts clients with a technical assistance consultant to provide guidance and expertise during the initial loan term. The program guidelines define eligible businesses to include wholesale and retail trades, service enterprises, commercial and industrial businesses, advanced firms, manufacturing firms and other emerging industry cluster businesses. For more information, please contact the URA’s Business Development Center at 412.255.6669. The Pittsburgh Home Ownership Program provides fixed, low interest, 30-year mortgage loans for low to moderate income home buyers. Our program has a low down payment requirement of 3%. A great feature of PHOP is that we offer what others don’t — help with your down payment and closing costs. The URA offers a Down Payment/Closing Cost Assistance grant up to $3,000, for income eligible borrowers. The income and eligibility guidelines are available on the URA site.Really, with this kind of incentive it just makes more sense to own your home than to continue renting. A ground breaking ceremony will be held at 52nd and Butler Street, in the Lawrenceville neighborhood of Pittsburgh, on Friday, May 15, 2009 at 3:00 p.m. to unveil the site of the new Youth Enterprise Zone Mini-Mall and Training Center sponsored by the Boys & Girls Clubs of Western Pennsylvania. This $2.5 million construction project has been in the planning stages for two years, and will seek LEED Silver Certification. The Boys & Girls Club developed the Youth Enterprise Zone Mini-Mall and Training Center as a strategy to increase services to teen populations and further their mission of enabling young people to reach their full potential as productive, caring, responsible citizens. The center will house all social venture business activities under one roof and provide opportunities for specialized workforce development training services. The Youth Enterprise Zone facility will serve at least 200 teens per year. The Mini-Mall Café is being designed by New Products Concept and Design Group out of New Jersey. The food service will include involvement by Unilever for a Breyer’s All Natural Ice Cream Franchise and Kraft’s Gevalia Coffee Shop. Lower Level – Backroom operations for gift basket assembly, poster and laminating production, program staff offices, inventory storage, and dedicated assembly area for workforce development activities. First Floor Level – Social venture business operations that include food service and retail sales of housewares, clothing, gift items, and specialty products. A workforce of twenty teens will be trained and employed on a consistent basis to manage, implement, and monitor all business operations. Interns and paid teen employees are primarily students from Career Connections Charter High School in Lawrenceville. Second Floor Mezzanine Level – Area dedicated solely for workforce development and training services to teen participants. Space utilization includes two general classrooms, two computer training centers, special education training classrooms, and two faculty offices. This project is made possible by funding support from Richard King Mellon Foundation, City of Pittsburgh Mayor Luke Ravenstahl, Governor Ed Rendell, State Senator Jim Ferlo, State Senator Jay Costa, Urban Redevelopment Authority of Pittsburgh, and an anonymous donor. In 1999 the Boys & Girls Clubs of Western Pennsylvania expanded services to inner city teens (ages 14 through 18) by creating a “Youth Enterprise Zone” program that focuses on workforce development and entrepreneurial training. In order to provide teens with “real world” business applications of classroom training, social venture businesses were created in the Lawrenceville community by the Boys & Girls Club. These include: Outlet Connection – a full service retail store, The Spot – a 1950’s style café, Catalog Sales – gift baskets and specialty items, Poster and Laminating Business, and an e-Commerce Website – promoting on-line sales of teen designed products. Over 400 teens have been engaged in the various social ventures since 1999. The business model is designed for teens to learn all aspects of venture operations which include purchasing, business finances, marketing, inventory control, security, customer service, food service operations, and short and long term sales projections and planning. true; with lower monthly payments, you can buy a new car, take a vacation or put a swimming pool in the back yard. 1. What fees do you charge? 2. How much are the fees? 3. What is the interest rate? 4. How long will it take me to pay off the loan? There is a lot of great information on the URA site. The above is from a URA program for current borrowers but I thought it was such good advice, I lifted it out and dropped it into this post. There is a lot of great information on the URA site. You should check in periodically because surprise! there are always new programs for homeowners, businesses and developers. In early December, representatives from the URA and the PHCA met with resident/artists from the neighborhood to discuss revitalization possibilities for Polish Hill. The URA’s ideas included townhouses placed to take advantage of some of the best views, possible including commissioned artwork as part of those developments (hence the presence of artists at the meeting). It quickly became evident that the artists were residents first and foremost; they were less interested in the prospect of commission opportunities than in the overall needs of the neighborhood. Townhouses didn’t appeal, but infrastructure, such as the condition of the steps, attending to derelict properties, and attracting small businesses were of great interest. This is an ongoing topic, one that’s addressed in an article in the current (Feb 4) issue of the City Paper. 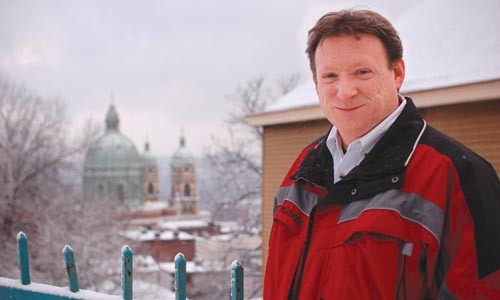 The article conveys a sense of the possibilities and problems we face, as well as questions about what the URA might be able to do for Polish Hill. The article also features a photo of PHCA president Terry Doloughty with a particularly characteristic expression. It’s a beautiful day, perfect for starting new projects. Like the groundbreaking ceremony on Penn and Gross Street, in the heart of the Penn Ave Arts Corridor. Three new town homes are slated for gthis corner lot, across the street from Garfield Artworks, in the middle of Unblurred territory. Read more about it on the Post Gazette.